This unique event allows interested Puna Homeowners Associations (HOA) to exchange ideas and gain knowledge in three concurrent sessions on Board Success and Meeting Success. 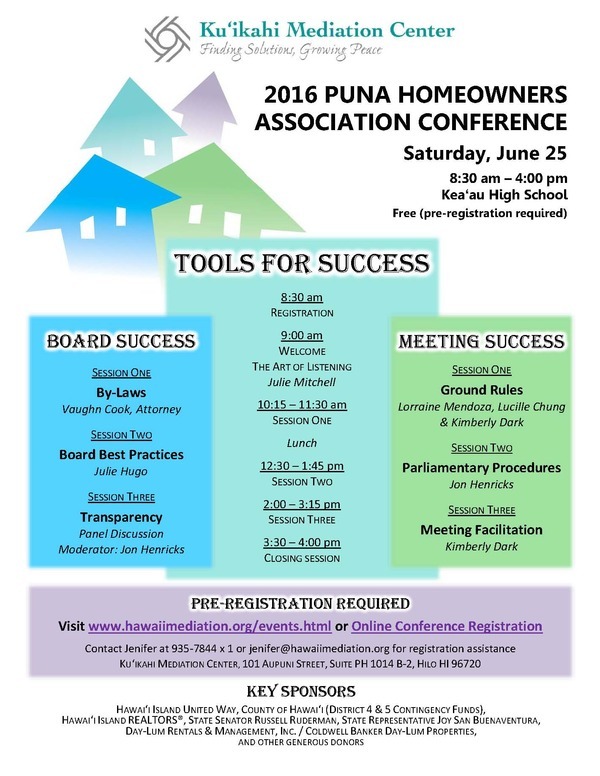 Puna HOA board officers, directors, staff, and community members will gain tools for success in the areas of member relations, association leadership, and meeting management. Board Success sessions are: “By-Laws” with Vaughn Cook, “Best Board Practices” with Julie Hugo, and “Transparency” with a panel moderated by Jon Henricks. Meeting Success sessions are: “Ground Rules” with Lorraine Mendoza, Lucille Chung & Kimberly Dark, “Parliamentary Procedures” with Jon Henricks, and “Meeting Facilitation” with Kimberly Dark. Pre-registration is required for the free conference, which includes lunch. Contact Jenifer at 935-7844 x 1 orjenifer@hawaiimediation.org for registration assistance.